This spring has been all about the world of Young Adult fiction for me. It started when I had the idea for a YA historical series, and I have loved my foray into this genre. Why? Admittedly, some of the heroines seem a little immature to me, but much about these books resonates in a universal sort of way. On the secular side, they are clean, action-packed, and not afraid to ask the hard questions about life. On the Christian side, they are actually edgier and more real than many of their adult counterparts. Put bluntly, teens won't tolerate any b.s., and since I won't either, YA fiction is a great fit for me. I'm going to quickly take you through some of the books I have read, not only this spring, but in the last year in the YA genre. In the Christian world Melanie Dickerson, Lisa Bergren, and Anne Elisabeth Stengl are some of the big stars. I've been enjoying Melanie's great fairy tale retellings for years, so I didn't actually read any this time around. You can find them in our Inky archives, though. I read Lisa Bergren's Glamorous Illusions last year and liked it, but didn't really connect with her River of Time series, although many of my adult friends loved it. As for Anne Elizabeth Stengl, I had a hard time getting into Heartless, but her vivid imagination and beautiful voice kept me reading. And I'm so glad I did. I was completely impressed by the gorgeous allegory in this story. Perhaps my biggest surprise was to learn that a book I stumbled on last year and looooved, Prophet by R. J. Larsen, is considered Y.A. I gobbled up this book in just a few days and enjoyed every word. I was mesmerized by her strong, courageous, spiritual heroine. I've been looking for an excuse to buy books two and three, and never even realized they were Y.A. until my agent mentioned it to me. (By the way, my agent knew this because she also represents R. J.) 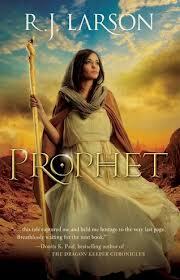 These books are called speculative, but I would describe them more as fantasy set in the Biblical era. Whatever they are, they're awesome, and I highly recommend them. In secular fiction, I found I have a real penchant for YA dystopian fiction. Of course I started with The Hunger Games series. Read them straight through. I could easily do a whole post about how they inspired me to find my inner strength and stand against injustice. I have to admit, though, that I wasn't crazy about the existential ending to the whole series. It was kind of a downer. Although the ending was realistic, I'm sure I wasn't the only one who wanted something more triumphant. 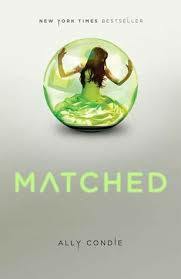 I'm working my way through the Matched series, which I've really enjoyed so far, and I also want to check out some other books which begin series including The Selection, Divergent, and Delirium. I've read samples of each, and they all look promising. I also gave Twilight a try, something I probably wouldn't have done if it wasn't for research purposes. This book did have a special sort of magic. I couldn't put it down. And yes, it is romantic on an epic scale. While the vampire element seemed completely fantasy-like and didn't bother me, I cannot in good conscience recommend it, especially not for teens. I felt the message of the book was that love conquers all, even if your boyfriend is inherently evil. Therefore, I felt girls could use this as a justification to get involved with destructive individuals like abusers and addicts. In fact, Edward's craving for Bella's blood is flat-out described as an addiction. There's a very real possibility he might kill her. The impression is given that playing with fire is somehow romantic. Here are just a few dangerous quotes I collected. But don't worry, I'm essentially a selfish creature. I crave your company too much to do what I should. ~ Edward. I refused to be convinced to fear him, no matter how real the danger might be. It doesn't matter, I repeated in my head. ~ Bella. I'm here, which roughly translated, means I would rather die than stay away from you. I'm an idiot. ~ Bella. While I don't think the author had bad intentions, I also do not think she fully thought through her responsibility to her young, impressionable readers. And I can't finish without mentioning that I've been reading an in-progress YA dystopian by our own Gina Welborn. Whoop! Whoop! It's so great, I can't wait for her to finish and find a publisher so you all can read it. I'll also keep you posted on the status of my own YA novel, the first in a series of action-packed medievals featuring strong female characters in traditional male roles. What YA novels have you found and loved? Any you wouldn't recommend? Oo, oo! You should check out the new titles from Playlist Fiction (www.PlaylistFiction.com). I've obviously read my critique partner's (Stephanie Morrill) THE REVISED LIFE OF ELLIE SWEET, and it's one of my all-time favorites. And on her recommendation I bought another Playlist title, GLASS GIRL by Laura Anderson Kurk, and it too is awesome. So beautifully written! If these two are indications of the other Playlist titles, then WOW. I've been on a YA binge, myself. Divergent and its sequel, Insurgent, were very good, IMO. And I just finished listening to all of Cassandra Clare's books -- The Mortal Instruments series and The Infernal Devices series. Good, but different. Not ones I'd recommend for teens, necessarily. Thanks for the recommendations of others to add to my list! So, Dina, I'm a closet YA fan. I keep telling myself it's because I hope to write one someday, but maybe it's because I really enjoy them. I'll be starting Matched series next. I keep picking them up and looking at them at the bookstore, so I'll be curious to know more about them if you have time to share. I really enjoyed Jill Williamson's first book that Jen reviewed here. I can't remember the name of it right now. Replicated, maybe. The book I just finished reading was secular, and I would caution adults to read it before letting their kids read it. Jekel Loves Hyde had an interesting premise, but had more than frequent use of God's name as a swear word, had the "f" word thrown in a few times, and had a few vulgar terms for certain body parts. The "almost" love scenes were tame, but there was a lot of focus on that particular subject. So, a promising premise was diluted down because of language and an obsession with sort of love scenes. The books that you'd think would be like that but weren't are a series called The Lying Game. There is a tv series based on the books, but the books are different, and better. Thanks for the recommendations, Roseanna. Glass Girl caught my eye at some point too. Niki, I saw the Clare books, but they didn't really catch my interest. The opening for Divergent was awesome, though, I really want to get to that one. Suzie, isn't the cover for Matched just so yummy and gorgeous. That beautiful green dress is very significant in the book too. I started the "River of Time" books, but haven't had time to finish. I'm eager to read Melanie Dicerson's fairy tale books, too. As always, I'm WAY behind on my reading. I know, DeAnna. Even when I enjoy books, I have a hard time finishing them these days. Well, my WIP is due on June 1st. Once I started Prophet, I pretty much read it straight through. My teenage daughter has read almost every single book you mentioned today (except the Twilight series). She loved Divergent and The Selection, but another of her favourites is called Cinder - I think it's a dystopian kind of version of Cinderella. Amanda, I did see Cinder. Looks interesting. 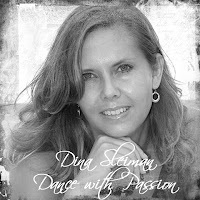 Great post, Dina. I've been reading lots of YA lately too. Cinder was very interesting. Only issue is the ending leaves things hanging. Something I have a problem with. Delayed gratification is hard! Hunger Games and the sequels were of course excellent. I've also enjoyed the Artemis Fowl series by Eoin Colfer, they are brilliantly imaginative. Oh, and I just finished Etiquette and Espionage by Gail Carrigan. A steampunk with lots of humor and adventure. Too many to name. Matched kind of leaves you hanging too, Lisa. It does have a fully developed plot, but all the big issues remain unresolved. Thanks for the suggestions. I'd be interested in checking out the steampunk. okay, not me. I havent read any of the ones you mentioned, never even got around to the Harry Potters. Though... I will heartily gobble up anything coming out of Inktropolis because I've seen enough bits and pieced to be fascinated with how you all can do it! The book follows young Ruby Tabeata in 1958 Greenwich Village. Ruby's parents are "beatnicks" and she has grown up in a very unconventional and unique way. She goes to school with the neighborhood kids at the local store (deciding their own hours, learning math from the cash register) and has to learn to be self-sufficient and tough at the very young age of 11. Ruby soon finds herself accused of stealing and sent to a children's care home because her home has been deemed unsafe. When she arrives, Ruby has to fight off a bully and her own panic at the thought of never seeing her family again. She does finally make her way home but she uncovers a family secret that means life as she knows it will never be the same. Lost and lonely Ruby decides to follow her heart to find the one thing she needs to help her heal. Her poetry and love of the arts motivates her and helps her find out who she is and what her path is in life :) It's a fantastic read! I can't promote it enough! My daughter and I have read and re-read it together. Thanks for your YA recommendations! Sounds like a winner. Thanks, Karen!